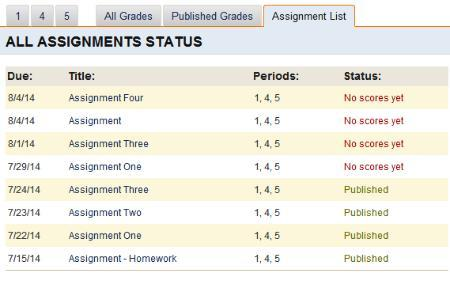 The Assignment List tab of the Gradebook displays a list of all assignments that were added for a course. The list is organized by due dates and includes the title of the assignment, the periods to which it was assigned, and the status. The status lets teachers know if the scores have been saved or published. If no scores have been saved or published, the status will display No Scores Yet. The titles of the assignments are links to the Assignment Scoresheet where the teacher can enter scores for all the students assigned for that particular homework.